Doctor of Chiropractic Dr. Weyrauch witnessed the healing power of chiropractic as a young boy. His father had long suffered from severe pain in his lower back, which made it difficult to walk or move freely. After visiting the chiropractor, however, his father’s back was normal to the point that it seemed nothing had ever been wrong. Dr. Weyrauch thought this was nothing short of miraculous. It certainly left a lasting impression on him. Dr. Weyrauch entered university thinking he wanted to pursue a career as a physical education teacher. The university had a hospital on campus and operated a medical program that incorporated students from his faculty into patient care. As part of his coursework, Dr. Weyrauch was fortunate enough to participate in patient care. To his disappointment, it seemed very little of the care the patients received promoted health. Instead, the care was all about addressing illness. A self-professed “doer,” Dr. Weyrauch has always been an active person, involved in athletics and physical activity. As a natural extension of his interest in physical health, Dr. Weyrauch developed a keen interest in nutrition and wellness. Chiropractic as a profession seemed to incorporate all those things and presented itself as an ideal choice for him. Dr. Weyrauch completed his chiropractic education at Canadian Memorial Chiropractic College, where he trained in multiple correction techniques, including Activator Methods®, Diversified and Thompson Terminal Point. Dr. Weyrauch incorporates all of these techniques, as your needs dictate, during each healing session. This unique approach to patient care is founded on three decades of experience and ongoing education. Lastly, Dr. Weyrauch stays current with the science of chiropractic and is highly progressive in his approach to your care. A devoted family man, Dr. Weyrauch has three grown sons. He and his wife Nancy enjoy spending time at their cottage north of Toronto and try to get there on a weekly basis. 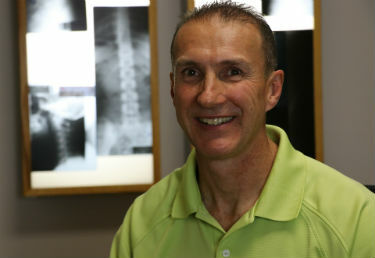 Dr. Weyrauch is an avid exerciser, sports fan and nature lover as well. With 30 years of experience caring for patients in North York and the surrounding communities, Dr. Weyrauch is confident he can help you with just about any problem you might have. There isn’t much he hasn’t seen. Why wait to get the relief you need? There is little doubt that Dr. Weyrauch can help you get to the root of your problem and correct it, putting you back on the road to health. Contact us today!